And now he kicked me out of chat, I never even said anything in the chat. LOL. Man those forum rep points must be like water for him. Well, let's stop speculating about motives and focus on the real problem again (him being a huge part of though). He closed the thread, censored the advise to measure voltages away and even discourages users to do so ('I have proven that the VDD33 voltage is not the problem'). So all we have now are Zador's measurements on his board where no problem occurs, we have @androsch's board where I can not measure since I sent it back to @androsch yesterday before new schematic release and Zador came up with the PHY_VDD33 suggestion and we now have to rely on others taking notice (quite unlikely given the weird situation in pine64 forum). So let's see what happens when @-L0thar-'s gear arrives and he's able to compare his two boards. As far as I tried measured in iperf it seems out speed. However, perhaps because of Packet loss, it takes a very time situation to apt-get update. Well, there are retransmissions and speed is relatively low. Is this legacy kernel or mainline? How do you power your board (microUSB or GPIO pins, power supply characteristics)? This is the other direction. Please have a look at posts #33 and #34. With @androsch's board by powering through the Euler pins I was able to immediately increase the throughput in the direction you tested now but not in the other. Please test again, this time from 192.168.122.171 to 192.168.122.223. I would assume numbers will be terribly low then. Do you have a Multimeter and are able to measure PHY_VDD33 as Zador outlined yesterday? First we need to check if we can reproduce both very low and normal results on the same board, otherwise we will get "numbers without meaning"
This data is the result of running with microUSB powered by mainline kernel. Because I do not own a multi-meter, it will not be able to measure the data. In post #33 I started with the USB PSU on the right using an 'average' (crappy) USB cable and powered through Micro USB. Tested in the same direction as @kometchtech and got pretty bad results. 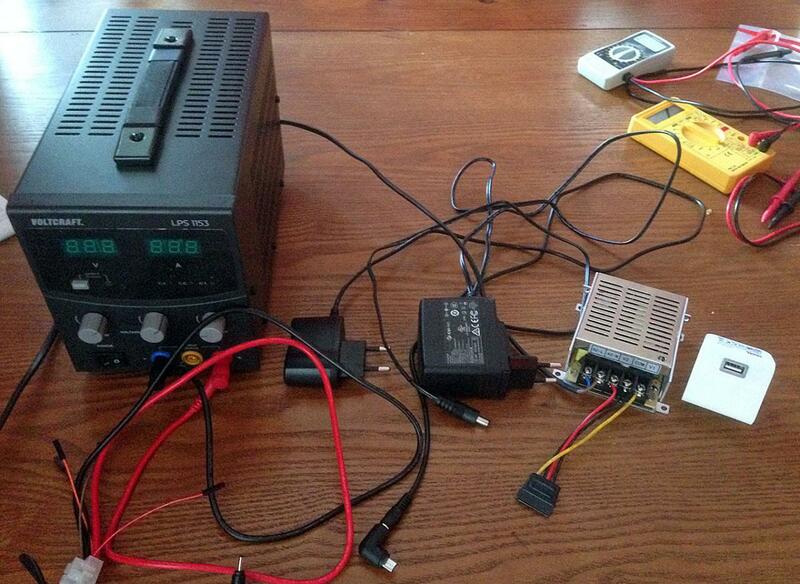 Then I replaced immediately USB PSU cable with the dual voltage PSU next to it and powered through Euler pins 4 and 6. In TX direction I got close to 900 Mbits/sec but in RX direction (apt-get update|upgrade ) everything remained bad. I don't really trust in the large PSU since when I did tests with the Wandboard Quad on weekend testing through SATA and USB performance with i.MX6 using this PSU led reproducable to no Ethernet (not even PHY leds blinking). I wasted two hours testing through all different Wandboard OS images (could've ported Armbian to Wandboard in the same amount of time ) just to realize that I had to use a different PSU. But that's a different story and needs more time/investigation. So I still find it hard to give any advice how to reproduce 'getting better numbers'. I only know that heavy undervolting (using a crappy USB cable) resulted in pretty bad TX numbers while providing almost 5V cured that. And I also know that I got strange voltage drops measured on the USB ports depending on how I powered @androsch's board. So it seems to be PSU related and I would already be happy if we're able to collect voltage numbers (measuring DC-IN, pins 4/6 on RPi and Euler headers and on the USB ports and of course also PHY_VDD33). I hope I didn't forget anything relevant. I have a 'bad' PINE64+ board, running armbian with legacy kernel, powered via micro-USB AC adapter. NIC and UART0 serial are the only active peripherals. 100Mbps is perfectly fine, but there's a major packet loss at 1Gbps, no need for iperf to tell there's an issue. That voltage is within tolerance range of 2.97V to 3.63V for PHY VDD33 (per PHY DS). PMIC AC input tolerance range is 3.5V to 7V (per PMIC DS), so PHY should be getting conditioned ~3.3V consistently, even when microUSB AC source is used. Unfortunately I don't have a scope to monitor continuously, but if AC-IN voltage drops were affecting 1Gbps communications, I'd expect them to equally affect 100Mbps communications and that is not the case. So the issue with my board doesn't seem to be caused by PHY input voltage fluctuations. I'd speculate that there's possibly another element sensitive to AC input inconsistencies that might not be conditioned by the PMIC or that may have a narrow tolerance range. Alternatively, PINE64+ PCB layout might not be strictly following guidelines for RTL8211E IC as set forth in PHY DS, resulting in EMI affecting its operation or VDD10 conditioned input being outside of a narrow 0.95V to 1.06V tolerance range. So I've fiddled around with EMAC IC and its RGMII interface to PHY IC. I was trying to dump EMAC DMA TX/RX descriptors and buffers to get an idea of whether frames received by PHY make it to EMAC over RGMII and vice versa, but so far didn't manage to access them from userland. I guess it would take to debug EMAC driver to monitor them and accumulate TX/RX frames and errors statistics. in the mainline kernel, and I get the data in power from the GPIO. The output of the power supply adapter is 5V/3A is written. I finally reformatted my USB flash drive as btrfs, and made a zeroed 1G file as you suggested earlier (with compression on). I'd started armbian up again a youtube upload for tonight, so thought I'd make that file first,and then see what the transfer speed was like. I'm copying to the same desktop computer as before, but it's booted in to windows (I know, you won't like it) this time (dual-boot), and it was... fast... damn near missed getting the screenshot! 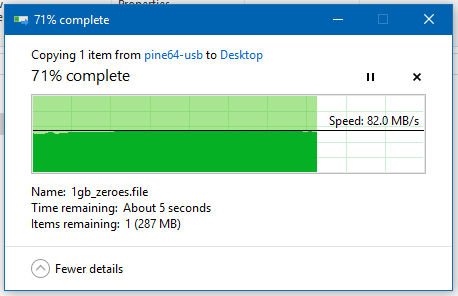 Well, it has been already known that Pine64+ is capable of exceeding 80 MB/s based on 'raw' iperf3 numbers (only one person needed to be convinced, thanks for doing the job). It would be great if you could grab 'Helios LanTest' (available at http://webshare.helios.de user 'tools', pwd 'tools') and run each 3 times with the settings for 'Very fast' and 'Enterprise' networks. Exactly, I was especially interested in those little orange arrows (in case you ever test again with LanTest please mouse over a bar with huge variations and see what happens). Thanks! lol... sound about right... another file management tool I use does exactly the same thing... uses multiple I/O threads, and also uses larger buffers for certain transfers (i.e. drive to drive, or via network IIRC). I'll throw that in just for fun... and also the reverse direction file copy... the 1gb of zeros TO the pine64 this time... looks like the brtfs is pretty happy to compress that puppy down as it goes... so happy in fact that I don't see the USB lighting up much during the transfer :-) So it will be interesting to see what happens once the dual USB opens up. I will say that after transferring of the the more typical data types (for me anyway - some 270MB of uni assessments and notes, and about 250MB worth of PDF datasheets)... it processed very quickly... It it understandably fell over the zillions of small files that were in a 2.1GB datasheet... (there were a heck of a lot of small c files in it) and was dropping to 10MB/s speeds... but picking up again when hitting some big files (bottom sceenshot). And on a repeat run of LanTest on GbE, the measurement with the biggest swing was the 'write 300MB to file' test again, with a AVG as 52.7 MB/s, and the min and max in the tooltip were 51.2MB/s and 67.4MB/s. The read 300MB/s test only had about a 2MB/s swing... (65.0 - 67.4), and all the others really didn't have too much separation ether. vorrei sapere come posso andare avanti dal momento che mi chiede login dopo root 1234 cosa devo fare? LOL, the same person (Charbax) showcases Allwinner's reference design and 5 months later the very same device in pink (known as Azpen Hybrx now). Update: TL Lim from Pine64 sent out a couple of hardware: 3 Pine64+ 2GB, WiFi/BT modules, one 7" LCD and a camera module. I only had time to check for the GbE issue (only one Pine64+ affected so two are working!) and LCD. Works flawlessly with Android 7.0 (checked only whether Android on Pine64 now behaves like Armbian and resizes the image on first boot -- check!) but not with Linux in my few tests with Armbian legacy build, the board simply freezes or even powers down with LCD connected. It seems we have an AXP803 PMIC problem with legacy u-boot/kernel here since this occurs even without DT modifications. The size of uboot is 000e4000. The size of uboot is 000e8000. [    0.000000] psci: PSCIv0.2 detected in firmware. [    0.000000] Architected cp15 timer(s) running at 24.00MHz (phys). [    8.673692] virtual base = 0xffffff800000a000. [    8.676438] gicd_base = 0xffffff800000c000. [    8.680577] gicc_base = 0xffffff800000e000. [    8.715640] SMP: Total of 4 processors activated (192.00 BogoMIPS). [    8.783597] hw-breakpoint: found 6 breakpoint and 4 watchpoint registers. [    8.957425] pwm module init! [    9.007423] Advanced Linux Sound Architecture Driver Initialized. [    9.050283] rtc physical base = 0x0000000001f00000 . [    9.055216] np name = /soc@01c00000/rtc@01f00000. [    9.059849] base = ffffff8000070100, len = 4. [    9.064112] pmu name: pmu0 . [    9.066975] pmu0_enable = 0x1. [    9.069998] pmux_id = 0x6. [    9.072727] pmux_twi_id = 0x1. [    9.075796] pmux_twi_addr = 0x34. [    9.079130] pmu name: pmu1 . [    9.081989] Warning: can not find np for pmu1. [    9.092585] after inited: sys_mask config = 0x4a55. [    9.097307] Warning: can not find np for dynamic_standby_para. [    9.107519] Notice: sun9i&sun8iw5&sun50i not need support normal standby,   . [    9.536578] lock super standby defaultly! [    9.568739] NTFS driver 2.1.30 [Flags: R/W]. [    9.671612] sunxi-bt bt.29: Missing bt_power. [    9.711959] sunxi-wlan wlan.28: Missing wlan_power. [   10.701350] [cedar]: install start!!! [   10.745902] [cedar]: install end!!! [   10.810146] sunxi budget cooling probe start ! [   10.830902] sunxi gpu cooling probe start ! [   10.931845] sunxi-mmc 1c0f000.sdmmc: Got CD GPIO #166. [   11.100284] sunxi-mmc 1c0f000.sdmmc: smc 0 p0 err, cmd 52, RTO !! [   11.107750] sunxi-mmc 1c0f000.sdmmc: smc 0 p0 err, cmd 52, RTO !! [   11.180808] sunxi-mmc 1c0f000.sdmmc: smc 0 p0 err, cmd 5, RTO !! [   11.181620] sunxi-mmc 1c0f000.sdmmc: smc 0 p0 err, cmd 5, RTO !! [   11.182432] sunxi-mmc 1c0f000.sdmmc: smc 0 p0 err, cmd 5, RTO !! [   11.183243] sunxi-mmc 1c0f000.sdmmc: smc 0 p0 err, cmd 5, RTO !! 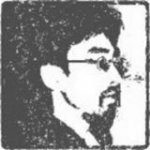 [   11.256322] mmc0: host does not support reading read-only switch. assuming w.
[   11.327235] sunxi-mmc 1c10000.sdmmc: smc 1 p1 err, cmd 52, RTO !! [   11.334725] sunxi-mmc 1c10000.sdmmc: smc 1 p1 err, cmd 52, RTO !! [   11.338969] sunxi-mmc 1c10000.sdmmc: smc 1 p1 err, cmd 8, RTO !! [   11.339776] sunxi-mmc 1c10000.sdmmc: smc 1 p1 err, cmd 5, RTO !! [   11.340580] sunxi-mmc 1c10000.sdmmc: smc 1 p1 err, cmd 5, RTO !! [   11.341385] sunxi-mmc 1c10000.sdmmc: smc 1 p1 err, cmd 5, RTO !! [   11.342189] sunxi-mmc 1c10000.sdmmc: smc 1 p1 err, cmd 5, RTO !! [   11.342996] sunxi-mmc 1c10000.sdmmc: smc 1 p1 err, cmd 55, RTO !! [   11.343800] sunxi-mmc 1c10000.sdmmc: smc 1 p1 err, cmd 55, RTO !! [   11.344605] sunxi-mmc 1c10000.sdmmc: smc 1 p1 err, cmd 55, RTO !! [   11.345409] sunxi-mmc 1c10000.sdmmc: smc 1 p1 err, cmd 55, RTO !! [   11.346262] sunxi-mmc 1c10000.sdmmc: smc 1 p1 err, cmd 1, RTO !! [   11.522424] Netfilter messages via NETLINK v0.30. [   11.534851] ctnetlink v0.93: registering with nfnetlink. [   11.550307] NF_TPROXY: Copyright (c) 2006-2007 BalaBit IT Ltd.
[   11.849338] init: init first stage started! [   11.863643] SELinux: 2048 avtab hash slots, 6593 rules. [   11.876305] SELinux: 2048 avtab hash slots, 6593 rules. [   11.898725] SELinux:  Completing initialization. [   11.903762] SELinux:  Setting up existing superblocks. [   12.276343] init: init second stage started! [   12.702418] ueventd: ueventd started! [   13.200695] ueventd: Coldboot took 0.50s. [   13.207418] init: Waiting for /dev/.coldboot_done took 0.52s. [   13.207739] init: Unable to set adequate mmap entropy value! [   13.282380] [NAND]Failed to insmod nand!!! [   13.306274] The number of cylinders for this disk is set to 242560. [   13.760550] host_chose finished 86! [   14.324448] The partition table has been altered. [   14.928947] The filesystem is already 1201664 blocks long. Nothing to do! [   17.466418] get ctp_power_io is invalid. [   17.523025] get_detect_list: script_get_item err.support_number = 6. [   17.547995] get_detect_list: script_get_item err.support_number = 2. [   17.579451] [VFE]cci probe end cci_sel = 0! [   17.656168] sw_get_write_info:read erro or read null ! [   17.661920] get write info erro! [   17.665622] twi_start()370 - [i2c1] START can't sendout! [   17.671663] twi_start()370 - [i2c1] START can't sendout! [   17.677712] twi_start()370 - [i2c1] START can't sendout! [   17.702266] twi_start()370 - [i2c1] START can't sendout! [   17.708311] twi_start()370 - [i2c1] START can't sendout! [   17.714371] twi_start()370 - [i2c1] START can't sendout! [   17.731785] twi_start()370 - [i2c1] START can't sendout! [   17.737824] twi_start()370 - [i2c1] START can't sendout! [   17.743875] twi_start()370 - [i2c1] START can't sendout! [   17.761347] twi_start()370 - [i2c1] START can't sendout! [   17.767434] twi_start()370 - [i2c1] START can't sendout! [   17.768159] [VFE]csi probe end csi_sel = 0! [   17.769899] [VFE]isp probe start isp_sel = 0! [   17.791296] twi_start()370 - [i2c1] START can't sendout! [   17.797193] [ISP] isp platform_id = 3! [   17.801304] [VFE]isp probe end isp_sel = 0! [   17.810508] twi_start()370 - [i2c1] START can't sendout! [   17.810756] twi_start()370 - [i2c1] START can't sendout! [   17.811005] twi_start()370 - [i2c1] START can't sendout! [   17.830089] [VFE]mipi probe start mipi_sel = 0! [   17.830187] twi_start()370 - [i2c1] START can't sendout! [   17.830435] twi_start()370 - [i2c1] START can't sendout! [   17.830683] twi_start()370 - [i2c1] START can't sendout! [   17.849861] twi_start()370 - [i2c1] START can't sendout! [   17.850109] twi_start()370 - [i2c1] START can't sendout! [   17.850358] twi_start()370 - [i2c1] START can't sendout! [   17.869541] twi_start()370 - [i2c1] START can't sendout! [   17.869789] twi_start()370 - [i2c1] START can't sendout! [   17.870037] twi_start()370 - [i2c1] START can't sendout! [   17.887234] [VFE]mipi probe end mipi_sel = 0! [   17.889220] twi_start()370 - [i2c1] START can't sendout! [   17.889468] twi_start()370 - [i2c1] START can't sendout! [   17.889717] twi_start()370 - [i2c1] START can't sendout! [   17.908901] twi_start()370 - [i2c1] START can't sendout! [   17.909149] twi_start()370 - [i2c1] START can't sendout! [   17.909397] twi_start()370 - [i2c1] START can't sendout! [   17.938433] twi_start()370 - [i2c1] START can't sendout! [   17.938682] twi_start()370 - [i2c1] START can't sendout! [   17.938930] twi_start()370 - [i2c1] START can't sendout! [   17.958096] twi_start()370 - [i2c1] START can't sendout! [   17.958344] twi_start()370 - [i2c1] START can't sendout! [   17.958593] twi_start()370 - [i2c1] START can't sendout! [   17.977776] twi_start()370 - [i2c1] START can't sendout! [   17.978024] twi_start()370 - [i2c1] START can't sendout! [   17.978273] twi_start()370 - [i2c1] START can't sendout! [   18.007306] twi_start()370 - [i2c1] START can't sendout! [   18.007555] twi_start()370 - [i2c1] START can't sendout! [   18.007803] twi_start()370 - [i2c1] START can't sendout! [   18.026976] twi_start()370 - [i2c1] START can't sendout! [   18.027225] twi_start()370 - [i2c1] START can't sendout! [   18.027473] twi_start()370 - [i2c1] START can't sendout! [   18.056502] twi_start()370 - [i2c1] START can't sendout! [   18.056750] twi_start()370 - [i2c1] START can't sendout! [   18.056999] twi_start()370 - [i2c1] START can't sendout! [   18.076177] twi_start()370 - [i2c1] START can't sendout! [   18.076425] twi_start()370 - [i2c1] START can't sendout! [   18.076673] twi_start()370 - [i2c1] START can't sendout! [   18.086020] twi_start()370 - [i2c1] START can't sendout! [   18.086268] twi_start()370 - [i2c1] START can't sendout! [   18.086516] twi_start()370 - [i2c1] START can't sendout! [   18.105700] twi_start()370 - [i2c1] START can't sendout! [   18.105948] twi_start()370 - [i2c1] START can't sendout! [   18.106197] twi_start()370 - [i2c1] START can't sendout! [   18.125379] twi_start()370 - [i2c1] START can't sendout! [   18.125628] twi_start()370 - [i2c1] START can't sendout! [   18.125876] twi_start()370 - [i2c1] START can't sendout! [   18.145059] twi_start()370 - [i2c1] START can't sendout! [   18.145308] twi_start()370 - [i2c1] START can't sendout! [   18.145556] twi_start()370 - [i2c1] START can't sendout! [   18.164739] twi_start()370 - [i2c1] START can't sendout! [   18.164988] twi_start()370 - [i2c1] START can't sendout! [   18.165236] twi_start()370 - [i2c1] START can't sendout! [   18.184419] twi_start()370 - [i2c1] START can't sendout! [   18.184668] twi_start()370 - [i2c1] START can't sendout! [   18.184916] twi_start()370 - [i2c1] START can't sendout! [   18.204101] twi_start()370 - [i2c1] START can't sendout! [   18.204349] twi_start()370 - [i2c1] START can't sendout! [   18.204598] twi_start()370 - [i2c1] START can't sendout! [   18.223779] twi_start()370 - [i2c1] START can't sendout! [   18.224027] twi_start()370 - [i2c1] START can't sendout! [   18.224275] twi_start()370 - [i2c1] START can't sendout! [   18.243463] twi_start()370 - [i2c1] START can't sendout! [   18.243711] twi_start()370 - [i2c1] START can't sendout! [   18.243960] twi_start()370 - [i2c1] START can't sendout! [   18.263143] twi_start()370 - [i2c1] START can't sendout! [   18.263391] twi_start()370 - [i2c1] START can't sendout! [   18.263639] twi_start()370 - [i2c1] START can't sendout! [   18.282822] twi_start()370 - [i2c1] START can't sendout! [   18.283070] twi_start()370 - [i2c1] START can't sendout! [   18.283319] twi_start()370 - [i2c1] START can't sendout! [   18.302502] twi_start()370 - [i2c1] START can't sendout! [   18.302751] twi_start()370 - [i2c1] START can't sendout! [   18.302999] twi_start()370 - [i2c1] START can't sendout! [   18.322182] twi_start()370 - [i2c1] START can't sendout! [   18.322431] twi_start()370 - [i2c1] START can't sendout! [   18.322679] twi_start()370 - [i2c1] START can't sendout! [   18.341863] twi_start()370 - [i2c1] START can't sendout! [   18.342111] twi_start()370 - [i2c1] START can't sendout! [   18.342360] twi_start()370 - [i2c1] START can't sendout! [   18.361543] twi_start()370 - [i2c1] START can't sendout! [   18.361791] twi_start()370 - [i2c1] START can't sendout! [   18.362039] twi_start()370 - [i2c1] START can't sendout! [   18.381222] twi_start()370 - [i2c1] START can't sendout! [   18.381471] twi_start()370 - [i2c1] START can't sendout! [   18.381719] twi_start()370 - [i2c1] START can't sendout! [   18.400901] twi_start()370 - [i2c1] START can't sendout! [   18.401150] twi_start()370 - [i2c1] START can't sendout! [   18.401398] twi_start()370 - [i2c1] START can't sendout! [   18.420582] twi_start()370 - [i2c1] START can't sendout! [   18.420831] twi_start()370 - [i2c1] START can't sendout! [   18.421080] twi_start()370 - [i2c1] START can't sendout! [   18.440263] twi_start()370 - [i2c1] START can't sendout! [   18.440512] twi_start()370 - [i2c1] START can't sendout! [   18.440760] twi_start()370 - [i2c1] START can't sendout! [   18.459958] twi_start()370 - [i2c1] START can't sendout! [   18.460206] twi_start()370 - [i2c1] START can't sendout! [   18.460455] twi_start()370 - [i2c1] START can't sendout! [   18.479623] twi_start()370 - [i2c1] START can't sendout! [   18.479872] twi_start()370 - [i2c1] START can't sendout! [   18.480120] twi_start()370 - [i2c1] START can't sendout! [   18.499302] twi_start()370 - [i2c1] START can't sendout! [   18.499551] twi_start()370 - [i2c1] START can't sendout! [   18.499799] twi_start()370 - [i2c1] START can't sendout! [   18.518982] twi_start()370 - [i2c1] START can't sendout! [   18.519231] twi_start()370 - [i2c1] START can't sendout! [   18.519479] twi_start()370 - [i2c1] START can't sendout! [   18.538664] twi_start()370 - [i2c1] START can't sendout! [   18.538912] twi_start()370 - [i2c1] START can't sendout! [   18.539161] twi_start()370 - [i2c1] START can't sendout! [   18.558342] twi_start()370 - [i2c1] START can't sendout! [   18.558591] twi_start()370 - [i2c1] START can't sendout! [   18.558840] twi_start()370 - [i2c1] START can't sendout! [   18.578024] twi_start()370 - [i2c1] START can't sendout! [   18.578272] twi_start()370 - [i2c1] START can't sendout! [   18.578521] twi_start()370 - [i2c1] START can't sendout! [   18.597703] twi_start()370 - [i2c1] START can't sendout! [   18.597951] twi_start()370 - [i2c1] START can't sendout! [   18.598199] twi_start()370 - [i2c1] START can't sendout! [   18.617382] twi_start()370 - [i2c1] START can't sendout! [   18.617630] twi_start()370 - [i2c1] START can't sendout! [   18.617879] twi_start()370 - [i2c1] START can't sendout! [   18.637063] twi_start()370 - [i2c1] START can't sendout! [   18.637312] twi_start()370 - [i2c1] START can't sendout! [   18.637561] twi_start()370 - [i2c1] START can't sendout! [   18.656743] twi_start()370 - [i2c1] START can't sendout! [   18.656991] twi_start()370 - [i2c1] START can't sendout! [   18.657240] twi_start()370 - [i2c1] START can't sendout! [   18.676423] twi_start()370 - [i2c1] START can't sendout! [   18.676671] twi_start()370 - [i2c1] START can't sendout! [   18.676919] twi_start()370 - [i2c1] START can't sendout! [   18.696102] twi_start()370 - [i2c1] START can't sendout! [   18.696351] twi_start()370 - [i2c1] START can't sendout! [   18.696599] twi_start()370 - [i2c1] START can't sendout! [   18.715782] twi_start()370 - [i2c1] START can't sendout! [   18.716031] twi_start()370 - [i2c1] START can't sendout! [   18.716279] twi_start()370 - [i2c1] START can't sendout! [   18.735462] twi_start()370 - [i2c1] START can't sendout! [   18.735711] twi_start()370 - [i2c1] START can't sendout! [   18.735959] twi_start()370 - [i2c1] START can't sendout! [   18.755142] twi_start()370 - [i2c1] START can't sendout! [   18.755391] twi_start()370 - [i2c1] START can't sendout! [   18.755639] twi_start()370 - [i2c1] START can't sendout! [   18.773700] [VFE]fetch rear sensor list info start! [   18.774822] twi_start()370 - [i2c1] START can't sendout! [   18.775071] twi_start()370 - [i2c1] START can't sendout! [   18.775319] twi_start()370 - [i2c1] START can't sendout! [   18.794502] twi_start()370 - [i2c1] START can't sendout! [   18.794751] twi_start()370 - [i2c1] START can't sendout! [   18.794999] twi_start()370 - [i2c1] START can't sendout! [   18.813823] [VFE]Fetch sensor list form"/system/etc/hawkview/sensor_list_cfg"
[   18.814182] twi_start()370 - [i2c1] START can't sendout! [   18.814430] twi_start()370 - [i2c1] START can't sendout! [   18.814679] twi_start()370 - [i2c1] START can't sendout! [   18.833864] twi_start()370 - [i2c1] START can't sendout! [   18.834112] twi_start()370 - [i2c1] START can't sendout! [   18.834360] twi_start()370 - [i2c1] START can't sendout! [   18.853543] twi_start()370 - [i2c1] START can't sendout! [   18.853791] twi_start()370 - [i2c1] START can't sendout! [   18.854040] twi_start()370 - [i2c1] START can't sendout! [   18.873222] twi_start()370 - [i2c1] START can't sendout! [   18.873470] twi_start()370 - [i2c1] START can't sendout! [   18.873719] twi_start()370 - [i2c1] START can't sendout! [   18.892897] twi_start()370 - [i2c1] START can't sendout! [   18.898946] twi_start()370 - [i2c1] START can't sendout! [   18.905031] twi_start()370 - [i2c1] START can't sendout! [   18.922490] twi_start()370 - [i2c1] START can't sendout! [   18.928548] twi_start()370 - [i2c1] START can't sendout! [   18.934622] twi_start()370 - [i2c1] START can't sendout! [   18.951995] twi_start()370 - [i2c1] START can't sendout! [   18.958053] twi_start()370 - [i2c1] START can't sendout! [   18.964134] twi_start()370 - [i2c1] START can't sendout! [   18.981534] twi_start()370 - [i2c1] START can't sendout! [   18.987587] twi_start()370 - [i2c1] START can't sendout! [   18.993660] twi_start()370 - [i2c1] START can't sendout! [   19.011054] twi_start()370 - [i2c1] START can't sendout! [   19.017106] twi_start()370 - [i2c1] START can't sendout! [   19.023181] twi_start()370 - [i2c1] START can't sendout! [   19.040552] twi_start()370 - [i2c1] START can't sendout! [   19.046611] twi_start()370 - [i2c1] START can't sendout! [   19.052690] twi_start()370 - [i2c1] START can't sendout! [   19.070090] twi_start()370 - [i2c1] START can't sendout! [   19.076144] twi_start()370 - [i2c1] START can't sendout! [   19.082222] twi_start()370 - [i2c1] START can't sendout! [   19.099619] twi_start()370 - [i2c1] START can't sendout! [   19.105681] twi_start()370 - [i2c1] START can't sendout! [   19.111758] twi_start()370 - [i2c1] START can't sendout! [   19.125211] [vfe_warn]open file failed! [   19.129104] twi_start()370 - [i2c1] START can't sendout! [   19.129353] twi_start()370 - [i2c1] START can't sendout! [   19.129601] twi_start()370 - [i2c1] START can't sendout! [   19.148788] twi_start()370 - [i2c1] START can't sendout! [   19.154846] twi_start()370 - [i2c1] START can't sendout! [   19.160935] twi_start()370 - [i2c1] START can't sendout! [   19.178292] twi_start()370 - [i2c1] START can't sendout! [   19.184349] twi_start()370 - [i2c1] START can't sendout! [   19.190427] twi_start()370 - [i2c1] START can't sendout! [   19.207851] twi_start()370 - [i2c1] START can't sendout! [   19.213912] twi_start()370 - [i2c1] START can't sendout! [   19.219988] twi_start()370 - [i2c1] START can't sendout! [   19.241501] get sysconfig para erro! [   19.250077] get sysconfig para erro! [   19.258459] get sysconfig para erro! [   19.369993] get_detect_list: script_get_item err.support_number = 11. [   19.390904] get_detect_list: script_get_item err.support_number = 8. [   19.402254] get_detect_list: script_get_item err.support_number = 7. [   19.432713] get_detect_list: script_get_item err.support_number = 2. [   19.448865] get_detect_list: script_get_item err.support_number = 0. [   19.450105] [VFE]fetch rear sensor list info end! [   19.450154] [VFE]fetch front sensor list info start! [   19.450157] [VFE]Fetch sensor list form"/system/etc/hawkview/sensor_list_cfg"
[   19.683299] [vfe_warn]open file failed! [   19.986174] [VFE]fetch front sensor list info end! [   20.072063] [VFE]Find sensor name is "s5k4ec", i2c address is 5a, type is "Y! [   20.080245] [VFE]Sub device register "s5k4ec" i2c_addr = 0x5a start! [   20.092755] [VFE]registered sensor subdev is OK! [   20.263755] init: Not bootcharting. [   20.391659] [s5k4ec]sensor_write err at sensor_detect! [   20.397269] [s5k4ec]chip found is not an target chip. [   20.434060] [VFE]vfe sensor subdev unregister! [   20.438966] [VFE]Sub device register "s5k4ec" failed! [   20.487527] [VFE_WARN]NOT found this item:  gc2145, you can add this sensor ! [   20.497278] [VFE]Sub device register "gc2145" i2c_addr = 0x78 start! [   20.504235] [VFE_ERR]Error registering v4l2 subdevice No such device! [   26.304261] watchdogd: started (interval 60, margin 20)! [  130.243018] sunxi-mmc 1c10000.sdmmc: smc 1 p1 err, cmd 52, RTO !! [  130.250500] sunxi-mmc 1c10000.sdmmc: smc 1 p1 err, cmd 52, RTO !! [  130.275977] sunxi-mmc 1c10000.sdmmc: smc 1 p1 err, cmd 8, RTO !! [  130.276790] sunxi-mmc 1c10000.sdmmc: smc 1 p1 err, cmd 5, RTO !! [  130.277751] sunxi-mmc 1c10000.sdmmc: smc 1 p1 err, cmd 5, RTO !! [  130.278557] sunxi-mmc 1c10000.sdmmc: smc 1 p1 err, cmd 5, RTO !! [  130.279361] sunxi-mmc 1c10000.sdmmc: smc 1 p1 err, cmd 5, RTO !! [  130.280175] sunxi-mmc 1c10000.sdmmc: smc 1 p1 err, cmd 55, RTO !! [  130.281991] sunxi-mmc 1c10000.sdmmc: smc 1 p1 err, cmd 55, RTO !! [  130.282806] sunxi-mmc 1c10000.sdmmc: smc 1 p1 err, cmd 55, RTO !! [  130.283613] sunxi-mmc 1c10000.sdmmc: smc 1 p1 err, cmd 55, RTO !! [  130.284500] sunxi-mmc 1c10000.sdmmc: smc 1 p1 err, cmd 1, RTO !! [  144.938651] psci: CPU2 killed. [  145.622952] sunxi-mmc 1c10000.sdmmc: smc 1 p1 err, cmd 52, RTO !! [  145.630418] sunxi-mmc 1c10000.sdmmc: smc 1 p1 err, cmd 52, RTO !! [  145.666047] sunxi-mmc 1c10000.sdmmc: smc 1 p1 err, cmd 8, RTO !! [  145.674336] sunxi-mmc 1c10000.sdmmc: smc 1 p1 err, cmd 5, RTO !! [  145.682156] sunxi-mmc 1c10000.sdmmc: smc 1 p1 err, cmd 5, RTO !! [  145.689543] sunxi-mmc 1c10000.sdmmc: smc 1 p1 err, cmd 5, RTO !! [  145.696938] sunxi-mmc 1c10000.sdmmc: smc 1 p1 err, cmd 5, RTO !! [  145.704941] sunxi-mmc 1c10000.sdmmc: smc 1 p1 err, cmd 55, RTO !! [  145.712491] sunxi-mmc 1c10000.sdmmc: smc 1 p1 err, cmd 55, RTO !! [  145.719997] sunxi-mmc 1c10000.sdmmc: smc 1 p1 err, cmd 55, RTO !! [  145.727528] sunxi-mmc 1c10000.sdmmc: smc 1 p1 err, cmd 55, RTO !! [  145.746809] sunxi-mmc 1c10000.sdmmc: smc 1 p1 err, cmd 1, RTO !! [  146.905640] psci: CPU2 killed. [  149.268130] psci: CPU3 killed. [  150.493832] sunxi-mmc 1c10000.sdmmc: smc 1 p1 err, cmd 52, RTO !! [  150.501643] sunxi-mmc 1c10000.sdmmc: smc 1 p1 err, cmd 52, RTO !! [  150.539803] sunxi-mmc 1c10000.sdmmc: smc 1 p1 err, cmd 8, RTO !! [  150.547211] sunxi-mmc 1c10000.sdmmc: smc 1 p1 err, cmd 5, RTO !! [  150.554675] sunxi-mmc 1c10000.sdmmc: smc 1 p1 err, cmd 5, RTO !! [  150.562047] sunxi-mmc 1c10000.sdmmc: smc 1 p1 err, cmd 5, RTO !! [  150.569865] sunxi-mmc 1c10000.sdmmc: smc 1 p1 err, cmd 5, RTO !! [  150.577308] sunxi-mmc 1c10000.sdmmc: smc 1 p1 err, cmd 55, RTO !! [  150.584874] sunxi-mmc 1c10000.sdmmc: smc 1 p1 err, cmd 55, RTO !! [  150.592342] sunxi-mmc 1c10000.sdmmc: smc 1 p1 err, cmd 55, RTO !! [  150.599802] sunxi-mmc 1c10000.sdmmc: smc 1 p1 err, cmd 55, RTO !! [  150.619112] sunxi-mmc 1c10000.sdmmc: smc 1 p1 err, cmd 1, RTO !! [  151.628802] psci: CPU3 killed. [  155.565539] psci: CPU3 killed. [  157.335944] psci: CPU3 killed. [  159.303865] psci: CPU3 killed. [  161.864427] psci: CPU3 killed. [  164.421418] psci: CPU3 killed. [  165.667086] sunxi-mmc 1c10000.sdmmc: smc 1 p1 err, cmd 52, RTO !! [  165.674661] sunxi-mmc 1c10000.sdmmc: smc 1 p1 err, cmd 52, RTO !! [  165.709459] sunxi-mmc 1c10000.sdmmc: smc 1 p1 err, cmd 8, RTO !! [  165.717062] sunxi-mmc 1c10000.sdmmc: smc 1 p1 err, cmd 5, RTO !! [  165.724464] sunxi-mmc 1c10000.sdmmc: smc 1 p1 err, cmd 5, RTO !! [  165.731910] sunxi-mmc 1c10000.sdmmc: smc 1 p1 err, cmd 5, RTO !! [  165.739345] sunxi-mmc 1c10000.sdmmc: smc 1 p1 err, cmd 5, RTO !! [  165.746776] sunxi-mmc 1c10000.sdmmc: smc 1 p1 err, cmd 55, RTO !! [  165.754316] sunxi-mmc 1c10000.sdmmc: smc 1 p1 err, cmd 55, RTO !! [  165.761810] sunxi-mmc 1c10000.sdmmc: smc 1 p1 err, cmd 55, RTO !! [  165.769343] sunxi-mmc 1c10000.sdmmc: smc 1 p1 err, cmd 55, RTO !! [  165.788949] sunxi-mmc 1c10000.sdmmc: smc 1 p1 err, cmd 1, RTO !! [  166.192883] psci: CPU3 killed. [  169.143931] psci: CPU3 killed. [  170.577227] sunxi-mmc 1c10000.sdmmc: smc 1 p1 err, cmd 52, RTO !! [  170.585089] sunxi-mmc 1c10000.sdmmc: smc 1 p1 err, cmd 52, RTO !! [  170.619406] sunxi-mmc 1c10000.sdmmc: smc 1 p1 err, cmd 8, RTO !! [  170.634610] sunxi-mmc 1c10000.sdmmc: smc 1 p1 err, cmd 5, RTO !! [  170.642022] sunxi-mmc 1c10000.sdmmc: smc 1 p1 err, cmd 5, RTO !! [  170.649446] sunxi-mmc 1c10000.sdmmc: smc 1 p1 err, cmd 5, RTO !! [  170.656849] sunxi-mmc 1c10000.sdmmc: smc 1 p1 err, cmd 5, RTO !! [  170.664369] sunxi-mmc 1c10000.sdmmc: smc 1 p1 err, cmd 55, RTO !! [  170.671870] sunxi-mmc 1c10000.sdmmc: smc 1 p1 err, cmd 55, RTO !! [  170.679370] sunxi-mmc 1c10000.sdmmc: smc 1 p1 err, cmd 55, RTO !! [  170.686856] sunxi-mmc 1c10000.sdmmc: smc 1 p1 err, cmd 55, RTO !! [  170.707281] sunxi-mmc 1c10000.sdmmc: smc 1 p1 err, cmd 1, RTO !! [  171.112154] psci: CPU3 killed. [  175.835182] psci: CPU3 killed. Edit: Due to lack of time I only tested shortly with the LCD and maybe I suffered from bad PSU or anything else. Please get back to TL Lim and ask what to do. I can send you one of the working boards but need it here for some time to do a few tests before. For me this is fine, will be in hospital till beginning of November, so don't need a new board till that time. Its a real pain board. tkaiser, I have to ask, what HDMI drama? Please see post #1 here or NÂ°4 there. Given the similarities of HDMI drivers in H3 and A64 BSP I still wonder why there were so many issues with no display output at all but maybe that's just because the majority of Pine64 users had no idea about the SBC concept at all or simply believed in the marketing claims to get a '$15 supercomputer'? If I understand correctly, those issues also exists on H3, due to same HDMI IP and basically the same driver code? From my experience, A64 HDMI blob can be reproduced from H3 HDMI source + one function, which I published in OrangePi forum. So if anyone would like to play with it, it's possible, but license issues still remain. Currently I'm trying to port most HDMI patches from linux-sunxi repo to H3 kernel with some of my own fixes, so EDID negotiation and non 16:9 resolutions would be possible. It will take some time, though. I imagine that it would solve most of those issues? It will take some time, though. I imagine that it would solve most of those issues? To be honest: while testing with A64 a few hundred hours (unattended of course) I might have connected a display to the Pine64+ I had here maybe one or two times. IIRC I tried out whether the HDMI-to-DVI fixes known from A83T and H3 also match with A64 BSP kernel. So I'm definitely the wrong person to ask for display issues. But I highly appreciate that you look into. It can't be overestimated what you've done for H3 already. Do you have access to A64 hardware already?